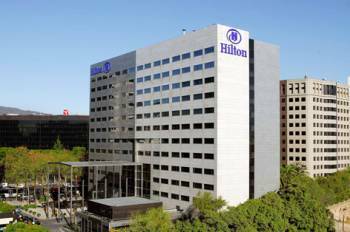 The Hilton Barcelona is in the very heart of the financial and commercial part of the city. It is just 15 minutes by car from Barcelona’s International Airport and 5 minutes from the “Palau de Congressos de Catalunya” conference centre or the “Fira Barcelona” trade fair centre. The main tourist attractions in the city are easily accessible from the hotel. Hilton Barcelona offers a wide range of meeting rooms to ensure the most appropriate location for your event, with 16 rooms ideal for meetings, conventions and social events. Our specially designed “Hilton Meetings” rooms are the ideal choice for events organisers that want the very best for their meetings, whether for 2 or 500 people. The flexibility of our rooms will surprise you. The magnificent 468 m2 Foyer, which can be divided into 4 independent rooms, is ideal for a cocktail or a special show. The 612 m2 Ballroom, with a capacity of 500 people, is the ideal framework for a luxurious gala dinner or some sort of party event in pure Spanish “fiesta” style. Our rooms offer you an endless number of possibilities.